Tartufo is Italian for “truffle” and these ice cream balls coated in crushed cookies and melted chocolate resemble large chocolate dessert truffles. Scoop ice cream into 6 balls, using 1/2-cup ice cream scoop. Roll in cookie crumbs. Place on wax paper-covered baking sheet; cover. Freeze 2 hours or until firm. Melt chocolate with oil in small saucepan over low heat, stirring constantly. Cool. Place wire racks over large sheets of wax paper. Remove ice cream balls from freezer; place on wire rack. Spoon 1 heaping Tbsp. melted chocolate over each ball, coating top and side of each ball. Freeze at least 1 hour or until firm. Spoon raspberry sauce onto 6 dessert dishes or plates. Cut each tartufo in half or quarters; arrange over sauce. Garnish with fresh raspberries. Serve immediately. Balance your food choices throughout the day so you can enjoy a serving of this rich-and-indulgent dessert at the end of the day. 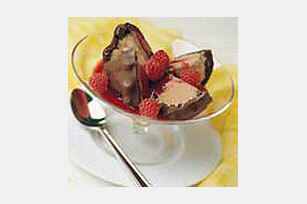 Substitute 1/2 cup chocolate-flavored hard-shell ice cream topping for the melted chocolate glaze. Prepare as directed, substituting 1 cup BAKER'S Semi-Sweet Chocolate Chunks for the chocolate.